The Lumos Smart Bike Helmet, which got its start as a Kickstarter project back in 2015, is the first bike helmet to make its way to Apple retail stores. 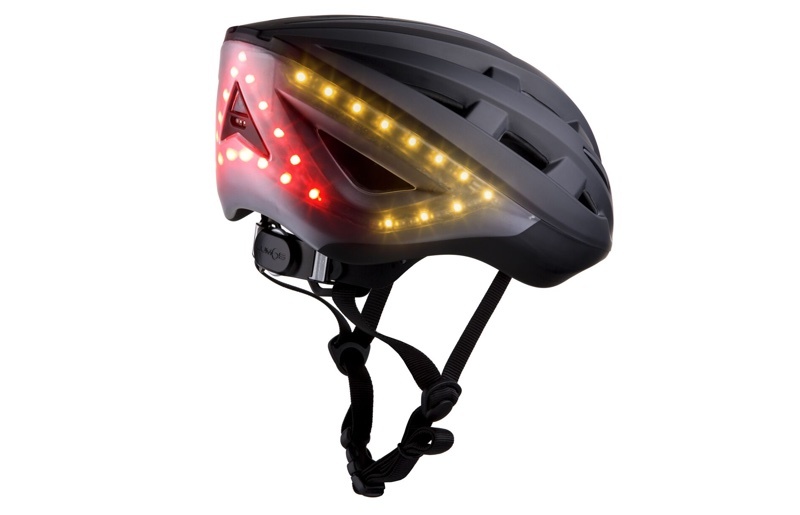 Available from the online Apple Store and in retail locations in the United States and Europe as of today, the $180 Lumos Helmet has integrated LEDs to keep you safe when riding at night and built-in gesture controlled turn signals. There are 10 white LEDs on the front, 16 red LEDs on the back, and 11 amber/red LEDs on each side that can serve as the aforementioned turn signals. 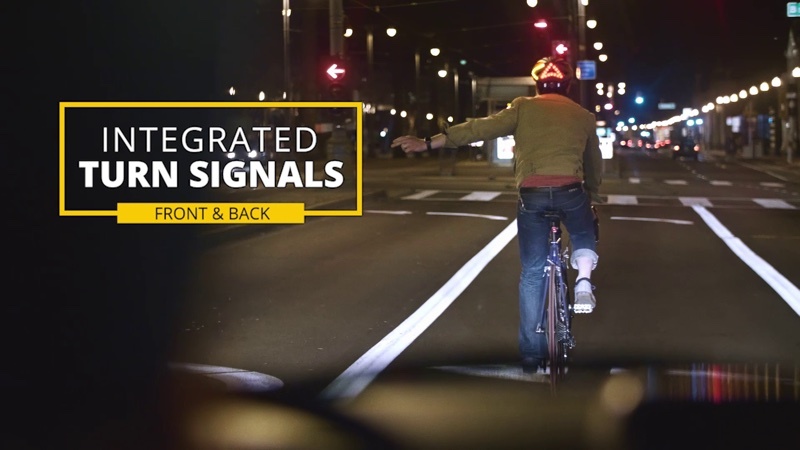 You control the turn signals built into the helmet with a connected Apple Watch, with the helmet able to interpret your hand gestures to activate the lights on the helmet. Previously, the helmet's built-in turn signals were controlled via a remote attached to the handlebars of a bike, but the new Apple Watch integration makes it simpler than ever to signal your intentions to drivers on the road. The Lumos Helmet also has a beta feature that's able to detect when you're braking hard on your bike, flashing the lights on the helmet to a bright red. 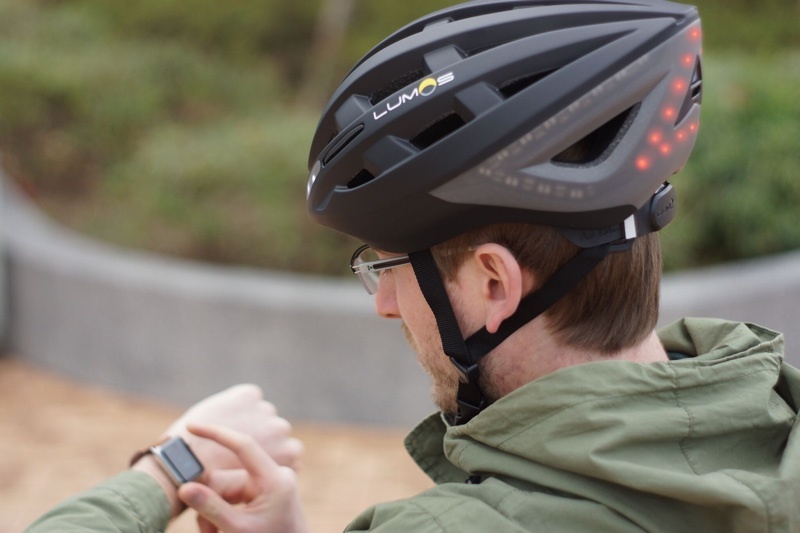 Through a Bluetooth connection to the iPhone, the Lumos Helmet records your bike riding activity and uploads it to the Apple Health or Strava app. Design wise, the helmet is safety certified and meets gold standard safety certifications in the United States and Europe, and it has been created to be durable and weatherproof so it can be used in rain, snow, and fog. There's just a single size available, which can fit most adult head sizes in the range of 21.3 to 24.4 inches. The Lumos Helmet can be purchased from the online Apple Store or through an Apple retail store for $179.95. Unfortunately, the smartest bike helmet is no helmet at all, as helmets lure traffic into a false sense of security. Ever see anyone go down without a helmet? Not a pretty sight. You seem to be presupposing that a helmet increases safety, which isn’t as clear-cut a case as it may seem. Thats a half truth...Yes some people act more idiotic when wearing an helmet, but that does not take away from the protection it provides. I live I Denmark, properly the country in the world with most bikes per capita. We use out bikes for everything, especially in our big cities as cars is an inconvenience. We see a lot of bike related accidents, and those which wear a helmet generally get out in a better condition then those without. No, I don't "presupposing that a helmet increases safety,". It does help prevent, and or, minimize head injuries. Riding skills have nothing to do with mechanical problems, sudden animals, children running jumping into the road in front of you, getting knocked off because of some jerk driving too close/ drunk. I'll keep my helmet on and and take that extra margin of safety. Good luck with being a vegetable. "It paints cycling as a horribly dangerous activity, and is it any wonder why few Americans choose to ride bikes in that kind of climate?" You mean as opposed to knee pads and wrist protectors for rollerblading? or knee pads for volleyball? Or the gazillions of protective products for football, baseball, hockey, or any other sport? Heck, they make protective knee pads for gardeners...does that make it a horribly dangerous thing to do (fear of snakes aside)? While the article you link to makes some level of clinical sense, you miss the whole point of the product above, which is to add turn and reflective signals to a helmet, where they are highly visible. Regardless of how you feel about helmets or how you feel about biking in general, having those turn signals on a helmet seems like a more logical solution than having them, say, tattooed directly on your scalp. Personally, I smell a ton of cow manure in that article. Like the idea of riders without helmets being appearing more vulnerable. Sorry, but if you're going to drive like a hosebag and run a rider off the road, you're not going to care whether the rider's noggin is covered. Yah a helmet should be replaced after a crash, or at least be inspected carefully by some one who know what he is doing. But hopefully you should not have a bad crash often, so you expense should still be low. and if you have a good insurance company you could properly get them to pay some of it, since it can safe them for a way higher expense later. But if they had made it a kit it would have been clever, then you would be able to transfer it to another helmet. In all honesty the cost of this thing isn't much more than a reasonably high-end helmet. I can easily shop for a regular helmet at that price (not that I'd want to). So either way if you get in a crash you're out some bucks. The same could be said for buying a bike. 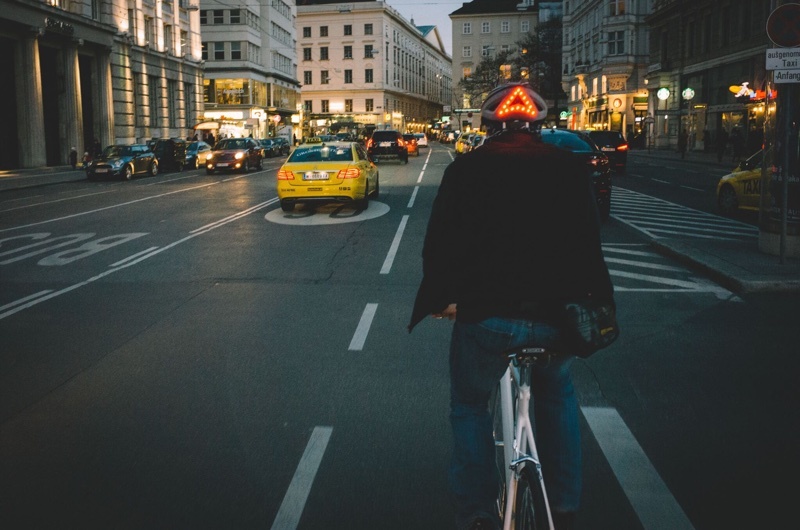 I'm all for devices that make city cycling safer, but if they really want to make a difference, make a helmet that reminds cyclists to stop at red lights and stop signs. Does the same go for driving without a seatbelt? Or a car without airbag? Assuming having four people + x per family the price is just ridiculous. This isn't a helmet for John and Jane to wear to ride their comfort bikes down the bike path at the local park – after driving there in their SUV – with their twin 8 year olds. Aside from the price tag, why’s that, exactly? The key feature of a turn signal is either a useful safety addition or it’s not. If it is, that applies to “John and Jane with their twin 8 year olds” just as much. Well, primarily because bike paths are often in a loop, or without complex navigation needs. This is – in my mind clearly – a helmet for commuters, riding on streets with large volumes of cars – and perhaps other bikes – at much higher speeds than you'll see little Johnny do on his 16" bike. The key feature is a useful safety addition in the right environment. If John and Jane are taking the kids out for group ride with the local bicycle shop, or the 10 miles to grandma's house on the streets of their city, then, sure, buy the whole family a set.